We’d love your help. Let us know what’s wrong with this preview of Make Your Bones by L.D. Bloodworth. Wren Bouchard’s first mistake is becoming entangled with a brutal hitman, escaping him could be her last.. Always looking over her shoulder, Wren never stays in one place too long. When her travels land her in a scenic town in the Rocky Mountains, she meets an intriguing stranger with secrets of his own. Wren begins to wonder if she can call Valley Springs home, but will her past come back to haunt her? ​Bloodworth successfully pens down an emotionally resonant story of love, loss, grief, and renewal. To ask other readers questions about Make Your Bones, please sign up. Wow, what a ride! I was hooked from the first page. 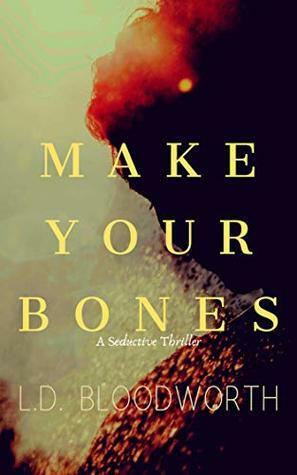 Make Your Bones is the story of Wren, a woman trapped in a relationship with a mob hit man and what happens when she tries to escape. As a teenager, Wren fell for the rich, attractive Aiden Luciano, dazzled by his money and power but unaware of the horrors a relationship with him would entail. Years later, she’s trapped by a controlling, abusive mafia man with little hope for her future. One day when he pushes too far and too hard leaving Wren b Wow, what a ride! I was hooked from the first page. Make Your Bones is the story of Wren, a woman trapped in a relationship with a mob hit man and what happens when she tries to escape. As a teenager, Wren fell for the rich, attractive Aiden Luciano, dazzled by his money and power but unaware of the horrors a relationship with him would entail. Years later, she’s trapped by a controlling, abusive mafia man with little hope for her future. One day when he pushes too far and too hard leaving Wren battered and broken, she decides she has nothing left to lose and takes matters into her own hands. With Aiden in prison, Wren spends the next years trying to remake herself. Never completely at ease and never staying in one place too long, her most recent move takes her to a small town in Colorado where she meets an intriguing man with secrets of his own. The two develop a relationship only to have it threatened when Wren’s past catches up with her. Make Your Bones is very well written and is a true page-turner. Bloodworth’s characters and settings come alive. As a reader, I felt Wren’s pain, I shared in Croy’s anguish, and I nearly looked over my own shoulder a few times! An easy five stars for me and, I think, for anyone who likes a good thriller with a steamy romance to boot. This story is just wonderful I could not put it down till it was finished. The author has written an amazing book. The villains are despicable perfectly so. The spiritual dimensions of the story run deep and resonate within my soul. It is hard to describe how real that felt, I don't think I can. Each person will take from it what they are meant to. Wren Bouchard arrives in scenic mountain town of Valley Spring, Colorado after fleeing a life of abuse and torture and found herself instantly drawn to the mysterious and handsome, Croy Parker. As she envisions a life full of love and safety, her past returns to haunt her. From the first page, the tension subtly rises as Wren’s life with the notorious hitman, Aidan Luciano unravels, revealing an abusive relationship rooted in deeply sadistic practices. Bloodworth takes a fresh outlook on an old, tried formula and successfully pens down an emotionally resonant story of love, loss, grief, and renewal. L.D. Bloodworth has lived in an area of the southern United States steeped in Gothic folklore and river superstitions, wives tales, and other generally dark mythology that shaped her writing style. She reads and writes dark fantasy, vampire fantasy, and romantic thrillers, most of which involve blood mysticism and/or religion. Her work can be found on her website and on Amazon.